Tiny Menu Addon Shrinks Your Menu Bar ! If you feel that your start-menu-for-portable-devices-pstart/">menu bar is holding unwanted menus and it looks very irritated means, an addon comes for you to fulfill vivaty-scenes-gives-fun-with-3d-in-this-virtual-world/">your needs. 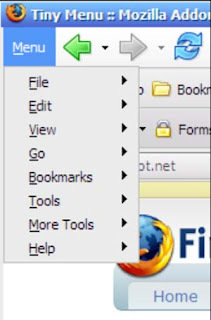 The name ofoutwit-docs-firefox-addon-lets-you-save-your-precious-time/"> the addon is Tiny Menu, which has the ability to replace the standard menu bar with a tiny menu popup. 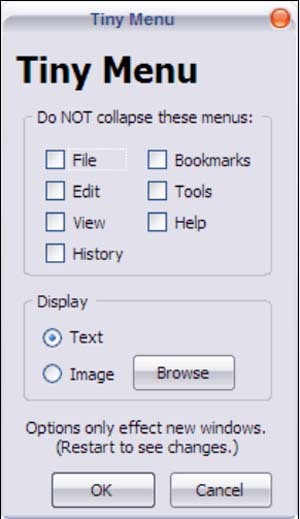 The main thing to be noted about this addon is it will never work with Mac OS as it has menus in how-to-hide-the-start-tab-in-taskbar/">different formats from other operating systems. If you will have, how-to-speed-up-download-in-firefox-without-download-manager/">any problem in this addon, communicate the author here.